Monday September 21, 2015. Well, today is to be a nice short walk . . . well, 15 km, apparently, but I will make short work of that bit of relief at the beginning of the day. And at some point here I will also rework the book’s description of the second half of the walk, writing what they SHOULD have told us, though I won’t blame them for my missing the left turn in Il Pitu. The book’s “stage” is twice as long as today’s walk for me, because the “stage” officially begins in Avilés, and goes to Soto de Luiña, but I did half of that yesterday. Today will be fun. This is a long walk, with few opportunities to break it into shorter stages. Departure from Avilés follows a circuitous route, remaining primarily on minor roads through a series of suburbs . The middle of the stage passes through a mix of more interesting towns, beginning with El Castillo’s fortress and concluding with El Pito’s Renaissance gardens. Okay . 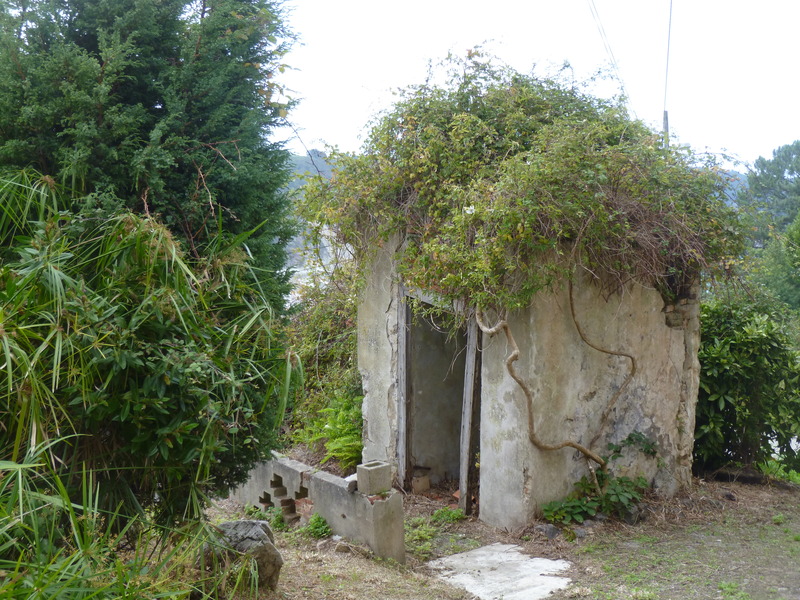 . . we did all of that but for El Pito (or Il Pitu) and its Renaissance gardens. Not relevant for today. Here’s what the authors summarize about the half I will walk today. The final stretch drags a bit, and has been shaken up by road construction, but it moves through a lush, expansive valley and concludes in pilgrim-friendly Soto de Luiña. And I’m giving credit where credit is due . . . but only once in this write. Here is the formal information about “my book.” Whitson, Dave; Perazzoli, Laura (2015-01-03). The Northern Caminos: The Caminos Norte, Primitivo and Inglés (International Walking) (Kindle Locations 1892-1896). Cicerone Press. Kindle Edition. Keep straight on the road out of Muros, transitioning to a picturesque footpath that winds through densely forested hills into Il Pitu/El Pito. Fair enough. 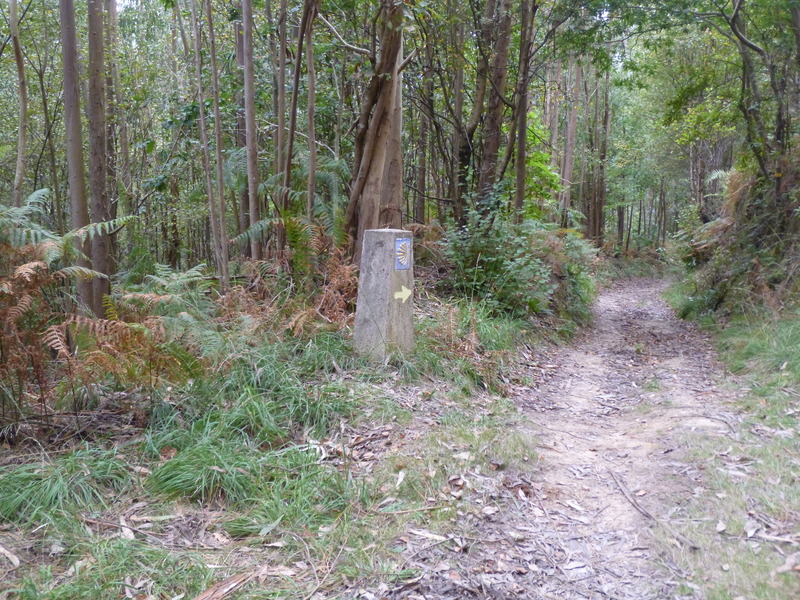 A long, perhaps 3 km downhill path through more eucalyptus forests. For the most part it is a good, dry path without the typical horridly stony surface. My feet like it. Then for a time, it is inordinately muddy, and if I didn’t have my hiking sticks, I’m not sure how I would have negotiated that part, up to my ankles in tar-like mud. But the muddy part isn’t too long, and as the path begins uphill again, it is dry, and I emerge in Il Pitu, head for the bar and have coffee and a croissant. Easy-peasy as one of my sisters often says. I leave the bar and happily move on. Keep straight on along the CU-2. Fork left after the church onto a road that quickly becomes a dirt road, and then a footpath. Turn right on a paved road, then fork left. I walk and walk through this small town, and then stop, turn around, and wonder whether I’m in the right place. An old woman, a very old woman, is walking toward me with her cane. I ask my usual question: “Donde esta Camino?” She breaks into a creaky little smile and begins her rapido Spanish, gesturing first one way and then another, nodding. I think that might mean it doesn’t matter which way I go . . . I’ll be on the Camino. Dubious, I continue walking. A bit farther on, I see an old man (but not as old as this woman) rushing past me with a key in his hand. I stop him and ask the same question. He nods and tells me (in Spanish, of course) that yes, this is the way. I’m just fine. Yes, yes. So I keep walking. So does he, and when he passes me again later, after having stopped to chat with some of his neighbors, he nods comfortingly and waves me on in this wrong direction. Soon, I am in the beginning of another town, Cudillero as the sign announces, and I’m going down down down, though not too steeply. I get out my phone, which has “my book” on the phone’s Kindle App. I scroll to this part of the map and see that “Cudillero” is not on my Camino path, although I do see where it is. Hmmm. I keep walking. Maybe eventually, if I follow the road long enough, I’ll get with my connection. And that will be true . . . 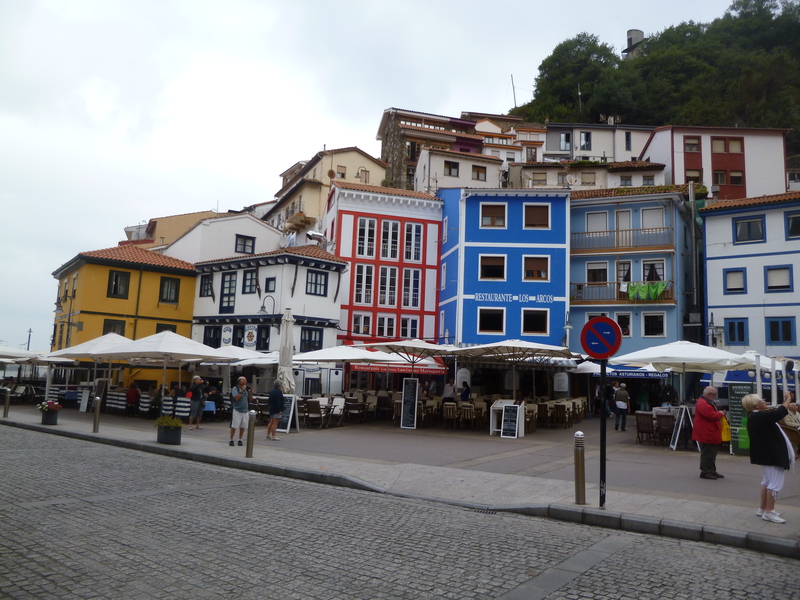 When I reach the middle of Cudillero, with people bustling about, I realize that it is another seacoast town, and a pretty one. But I’m not supposed to be on the coast. I hear a greeting and see a peregrina from Austria, someone I’ve met a few times along the way. I ask her what I should do. She tells me that she is staying here for a couple of days before she gets a train or bus to some bigger city so she can fly out of Bilbao in two days. And a few steps more . . .
Now, in addition to going the wrong way, are the instructions I would have been dealing with if I’d gone the RIGHT way. Sometimes the descriptions in this book can make one’s eyes cross. Keep straight on along the CU-2. Fork left after the church onto a road that quickly becomes a dirt road, and then a footpath. Turn right on a paved road, then fork left. Before reaching Hotel Lupa (singles 24– 30 €, doubles 45– 50, breakfast, 985 *** ***), 1.6km later, watch for a poorly marked right turn. Soon after, join the N-632. While the camino has traditionally gone to the south side of the highway, major construction projects have forced a detour, which will probably be in effect for the foreseeable future. Follow the N-632 for 600m. Fork right on the N632a. Keep straight on for 3km, pass the Hotel/ Restaurant, then make a sharp right downhill. Easy at twice the price, yes? Well, the tourist information woman looks at me with great sympathy. Yes, I can get back on my path going this way. I can simply follow the road for about 3 km, get to the next roundabout, look for the BROWN sign, a little one, that follows the right turn on the traffic circle. Turn right there, and I will immediately begin seeing the yellow arrows again. I smile with relief. She returns my smile, but sort of shakes her head in apology. “But the road . . . you have to go up. And up.” I ask her what else is new. She nods and wishes me Buen Camino. I follow the road. Up. And up. Switchback after switchback, sort of like the approach to Red Mountain Pass, but not at that elevation. Still, probably as steep and windy, with no real shoulder to walk on. 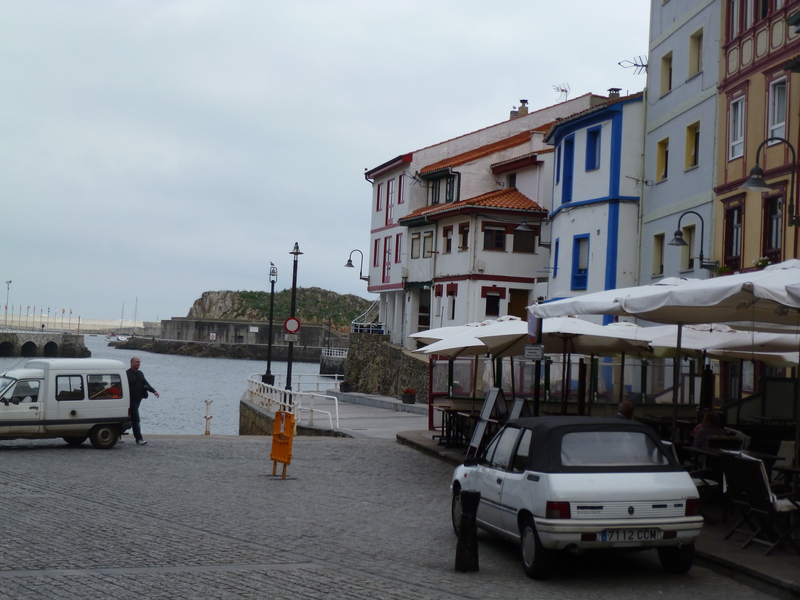 I face the traffic and hope everyone sees me as they whiz by, headed for Cudillero. I, however, am headed for a little brown sign on the big billboard for the traffic circle . . . 3 km. UP. On the way, it IS pretty, I must admit . . .
And on the way out of town . . . the hard way . . .
I’m not sure when the book and my little brown sign (which indeed takes me to my yellow arrows about 90 minutes after I leave the village) converge, but I’ll continue with the book’s official directions. Proceed 600m to the bottom of the hill, where arrows point in three different directions. 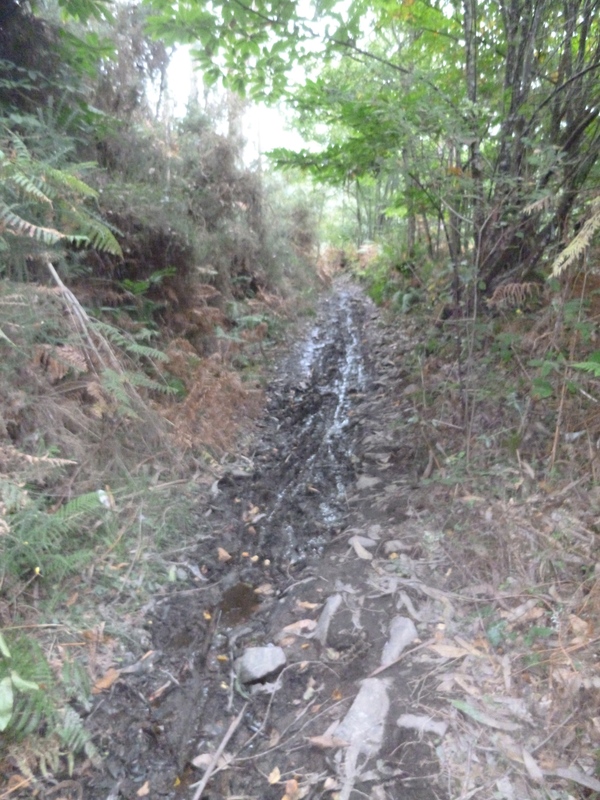 The official camino proceeds straight, but construction once again interferes . Detour signs point left. Follow the detour 1.1km, joining the N-632a into Artedo (bar). After 600m, fork right onto a dirt track shortly before [though it actually comes AFTER] a small bridge. Wind along the hillside for 900m until arriving in small Mumayor. I can never measure 600 m. or 900 m. or 5 km. for that matter, so I just follow the now- beloved arrows, no matter where they go. I don’t get to Artedo, though that was the name on the brown traffic circle sign. Maybe I would have gone through it if I had only “forked left at the church” in Il Pitu. I do see the hill, I do see the small bridge, and I can make sense of some of the directions. 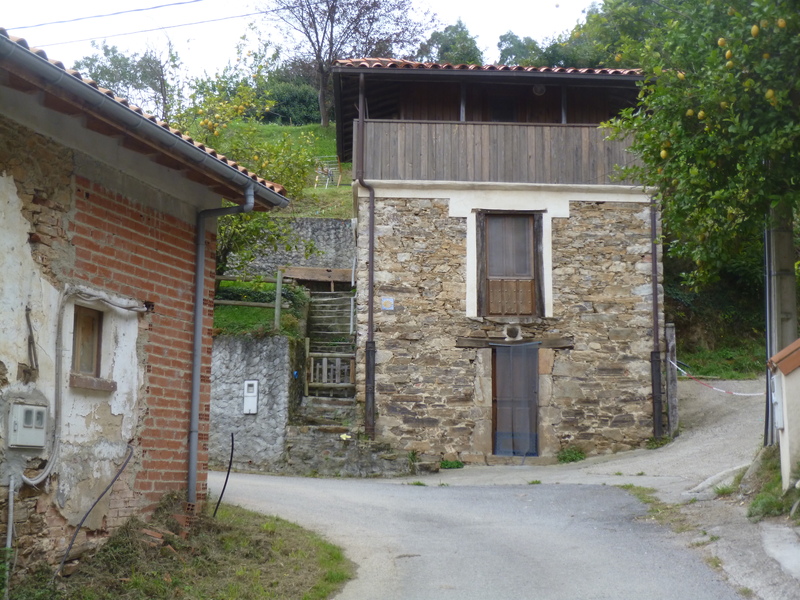 When I think I should be arriving in Soto de Luiña, LONG after I’ve been on the road for the time it would have taken to go 15 km, I see the rooftop evidence of “small Mumayor” and it is a lovely tiny village. Bean trestles and HUGE tomato vines, and families out with their kids along a very windy “road”, an old man picking the last of the beans in his garden, etc. Now let me say that once I was back with my arrows just after the traffic circle, the views were lovely, sometimes spectacular, out and over the valleys below me. 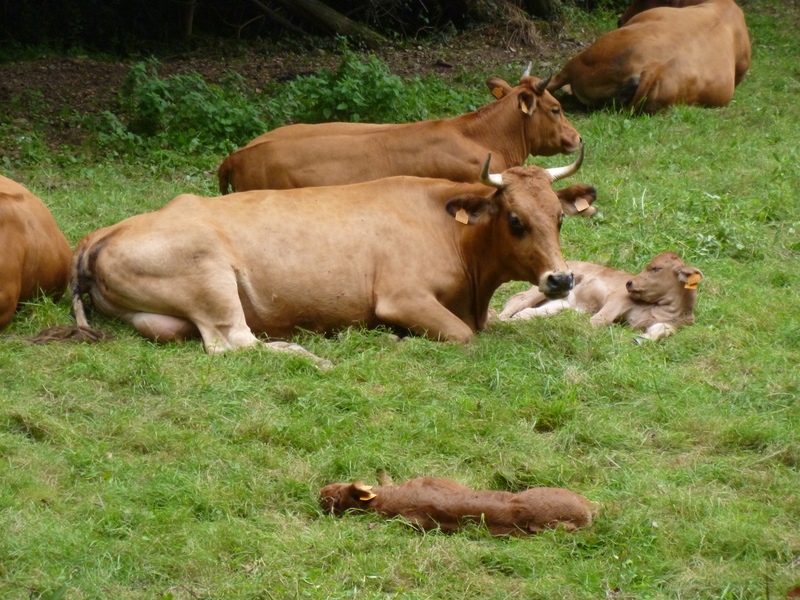 The farmland was peaceful, the animals gave me loving gazes, and I was really ready for the “final stretch”. Another little hut . . . Okay, sucker, fork right at the end of town, then left along a footpath. Continue down and down and down the footpath in a never-ending fairly gentle spiral. When there is still nowhere to turn and end this endless journey, you will see TWO sets of shells and arrows, as if you can’t believe your bad fortune. Someone has put these double markers on your one-and-only path just so you KNOW you haven’t missed the turn, you idiot. But you are still paying for your earlier error in Il Pitu, you pitiful pilgrim. Now you will hear birds. You will hear cowbells and traffic sounds, and you will have hope that you are approaching your destination. These are teasing reminders that there IS civilization out there . . . somewhere . . . cow bells, car noises, but we’re only teasing. You will even get a a glimpse of a tile-roofed town, but you’ll never really get there . . .But then all those sounds will go away, and the only thing that doesn’t go away is the downward path, with the lovely swaying eucalyptus trees high above you, and the mass of ferns everywhere, kissing your ankles, those parts of your body that are beginning to whimper. Oh, and your arms and hands will also begin to join this whimpering chorus because you are clutching the handles of your sticks with a death grip. In another twenty minutes, you will again hear cowbells and traffic. You will actually see the HUGE concrete structures that are the A-8 or the A-7 or one of those superhighways you will never have to walk on. You will EVEN see more tile roofs and some parts of actual exterior house walls, so now you will be SURE you are coming to your village. But you will be wrong. Continue to walk downhill on not-too horrid pathways, for at least another hour. The high, concrete bridges of the A-8 or A-7 will appear and disappear as if they were the guests in David Copperfield’s magic show. Your limbs continue to ache, pretending not to complain, but now your ankles feel like you have been stuck with boning knives, criss-crossed carefully, a pair for each ankle, inserted like the X of swords. Shish-kebob skewers have been implanted into the top of each foot. The skewers don’t go all the way through. They just sit straight, handles up, in the bony part of the foot. The bottoms of your feet will feel beaten, as though armies walked on them upside down. But since you are so lucky, you will have NO BLISTERS. Now you will be hobbling, and at least you won’t have to face any decisions about which way to go for the duration. I, the author of this unadulterated, realistic version of the Norte guide book, can tell you honestly. This little path will never engage with Soto de Luiña. You will need to begin looking for a Fern Grove Albergue. And there are many on this path . . . all donativo. Return to the N-634a for the final stretch into Soto de Luiña (11.3km), compliments of the authors of the official Camino del Norte book. 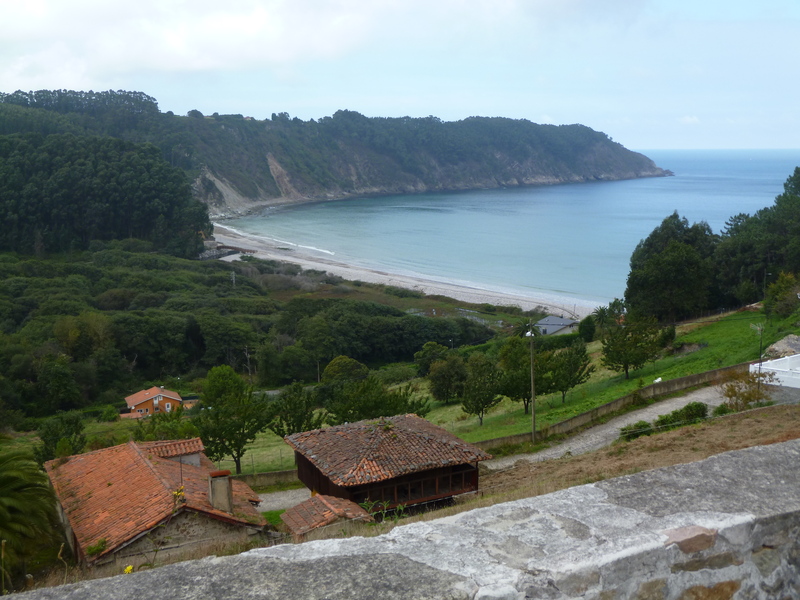 This entry was posted in Miscellany and tagged An alternate guidebook section, Camino del Norte, Cudillero, Fern Albergues, Il Pitu, Mistakes on the path, Soto de Luines. Bookmark the permalink. Well, I hope you have read Part Two at this point. I did survive, and after all, the authors of the book can only say two things . . . 1) “Well, we didn’t say how LONG it would take, but . . . ” and 2) “if you had just ‘forked left after the church’ you wouldn’t have had these problems,” But they wouldn’t be quite right. At any rate, the only thing that kept me sane as I walked down and down was that in my head, I was already writing this post! Yes, have read part two by now….As you heard sounds from towns and then they went away, I was worried that even this “remedy route” was also not right. At lease you did get somewhere, but this was a doubly long day for all the kms you walked at first (after the missed fork by the church) and then all the rest. I hope you are feeling well. You must be getting quite strong to have handled that.